﻿A simple idea and a simple request on twitter. 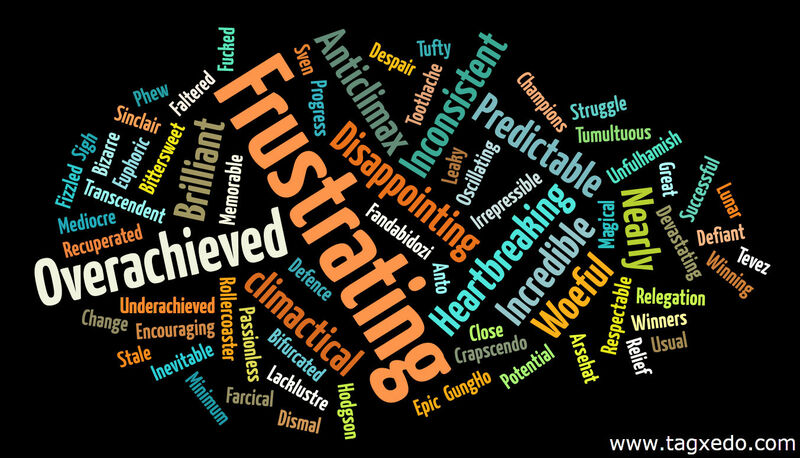 One word to sum up your team's season. Your word, your team and #onewordseason . The results are below, the higher the frequency of the word, the bigger the word. We got a great response in terms of coverage, fans of 48 teams responded covering all four English divisions, non-league, Scotland and France. But in another sense it was a completely depressing response, most respondees being from teams that have had disappointing seasons for one reason or another. Only a few, brief glimmers of happiness and hope. 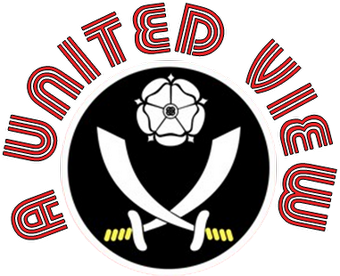 I've excluded those submitted by Sheffield United fans, as you might expect, they far exceeded any other club in number and they have a cloud all of their own. We had some made up words; Arsehat (Stockport County), Unfulhamish (Fulham), Crapscendo (Sunderland). We had odd words; Tufty (Everton) and Toothache (Scunthorpe). We had The Krankies; Fandabidozi (Manchester United). Players and managers got a mention; some for positive reasons, Tevez (Manchester City), others for negative reasons, Sinclair (Reading) and Hodgson (Liverpool). The effects of a 35 year trophy drought generated some stellar responses from Manchester City fans; Transcendent and Lunar. 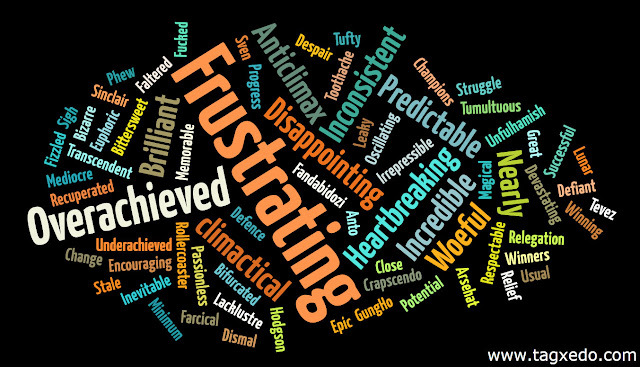 Whereas Leicester City fans (by far the biggest number of submissions) submitted 2 of the 5 occurences of Frustrating and both instances of Inconsistent, alongside Under-achieved amongst others. and one that didn't make it in, as it was used to describe the season in Scottish Football rather than a team...... Baws! I'll post the Sheffield United one shortly, worth a view for neutrals as an anatomy of a relegation. Arsenal, Aston Villa, Auxerre, Blackburn Rovers, Blackpool, Bolton Wanderers, Bristol City, Bristol Rovers, Burnley, Cardiff City, Celtic, Charlton Athletic, Cheltenham Town, Darlington, Derby County, Doncaster Rovers, Everton, Fulham, Hearts, Hull City, Leeds United, Leicester City, Leyton Orient, Lille, Liverpool, Macclesfield Town, Manchester City, Manchester United, Millwall, Newcastle United, Norwich City, Nottingham Forest, Peterborough United, Port Vale, Preston North End, QPR, Rotherham United, Salisbury City, Scunthorpe United, Sheffield Wednesday, Southampton, Stevenage Borough, St Johnstone, Stockport County, ﻿Sunderland, Swansea City, West Ham United.